Rev. Marta Valentín most recently worked for the UUA’s New England Region specializing in ministerial transitions. Prior to that, Rev. Marta served for 7 years as minister for First Church Unitarian in Littleton, MA. Her first settled ministry was at the First Unitarian Universalist Church in New Orleans where she arrived two weeks before Hurricane Katrina. She has also served as interim minister for the Unitarian Universalist Church of Arlington, VA, and at the UUA’s former staff group, Identity-based Ministries. She believes in shared ministry and views her ministry as helping her congregants find theirs. Rev. 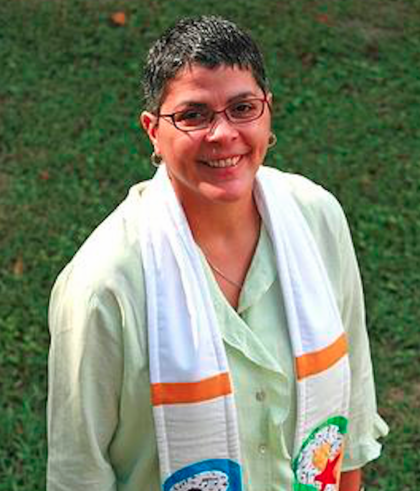 Marta has served on various UUA and UU Minister’s Association committees, including the continuing education committee. She is a founding member of the regional anti-racism/anti-oppression/multicultural group GRACE: Growing Racial and Cultural Equity. Rev. Marta lives in Ayer with her wife and their daughter. She was born in Spanish Harlem, NYC, and identifies as a Nuyorican – a Puerto Rican New Yorker. She is a poet, and her prayers and poems have been published by Skinner House Books in her meditation manual, A Long Time Blooming. Her works have also been published in a number of other books, including Lifting Our Voices and Becoming: A Spiritual Guide For Navigating Adulthood. She has also worked as a music producer for WGBH Radio and as a high school teacher. She is a very good salsa dancer, and often turns to salsa music when she is stuck with a sermon. After the service, join us for coffee and … read more. Our service this Sunday moves us into our next Soul Matters theme, “mystery”. I will be taking the perspective of mystery that involves “awe”. We welcome back the fabulous singer, Sayida Rivers Farmer, and Molly Ruggles is sharing her musical ministry once again. And of … read more. Join us for Sunday worship with Rev. Marta as we continue to explore what it means to live a life of Memory. This will be a “Whole Church” service – children and youth will remain in the sanctuary and we will all partake in … read more. Join us this Sunday for our version of a Dia de los Muertos/Day of the Dead Service…truth be told it is a syncretization that includes UU elements. Bring pictures of your beloved human or animal to place on our ofrenda/altar. This is the most beautiful part of the … read more. Join us for Sunday worship with Rev. Marta as we continue to explore what it means to be a people of Sanctuary. After the service, join us for coffee and refreshments in the fellowship hall. … read more. Join us for ‘tee-shirt Sunday’ Worship. We often wear our visions for ourselves or for the world right there on our bodies for all to see. We aren’t usually motivated to invest in a tee-shirt unless we are moved in some way by what the … read more. This Sunday, we start a new church year. Rev. Marta will lead our annual Water Communion service. All are welcome – please join us! See below for some excerpts from Rev. Marta’s email to the UUCM community. “How beautiful that when we gather again for “big church” what we … read more. This Sunday’s service is titled “Appreciating You” so it’s super important that you show up. We will witness and lovingly send Claire Carey over the Bridge into young adult land during our Bridging Ceremony. And there will be time to appreciate all that you do … read more.